Let’s take a trip back to the continental U.S. for a bit as some Ivy alumni set new records in Maine and North Carolina this past weekend. On Saturday, Ben True competed in his first event after a disappointing Olympic Trials – the TD Beach to Beacon 10km. 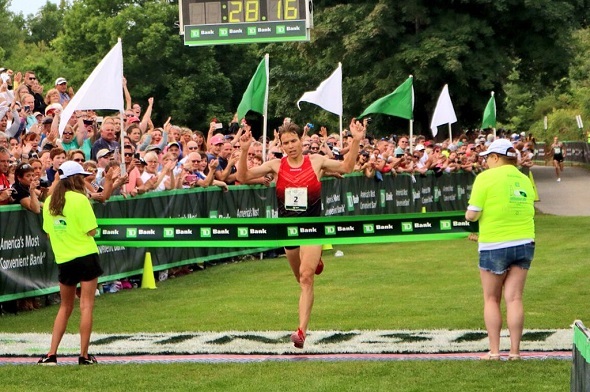 Using that pent-up frustration, True tackled the course but bided his time to take the lead from Kenyan William Malel Sitonik and American Dathan Ritzenhein. The three were bunched together until 600m to go, where True began to kick and powered to the win in 28:16.3, winning by 11 seconds and becoming the first American to ever win this race in the event’s 19 year history. True finished third in this race two years ago. Letsrun.com has a great race recap available here. Ashley Higginson participated in the women’s race, where she finished 17th overall in 34:48. 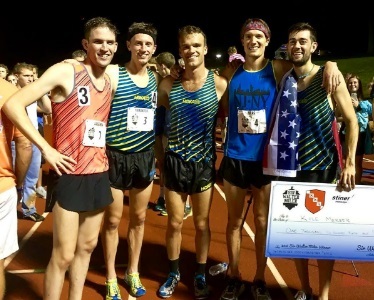 During the Olympic Opening Ceremonies on Friday night, Kyle Merber ran a new personal best en route to setting a North Carolina state record and meet record in the mile at the Sir Walter Miler. Merber ran 3:54.57 for the win after moving to the front of the field with 200m to go. This race had another NJ-NY Track Club 1-2-3 finish (they have done something similar over in Europe twice in the last month), as Colby Alexander was second and fellow Ivy Johnny Gregorek was third in 3:55.27. Merber’s time is also the 9th fastest mile time done by an American man this year as the top 9 finishers all broke 4:00 for the mile. If you have a FlotrackPro account, you can watch a video of the race here. This entry was posted on Sunday, August 7th, 2016 at 5:05 pm. It is filed under Alumni, Spotlight. You can follow any responses to this entry through the RSS 2.0 feed.